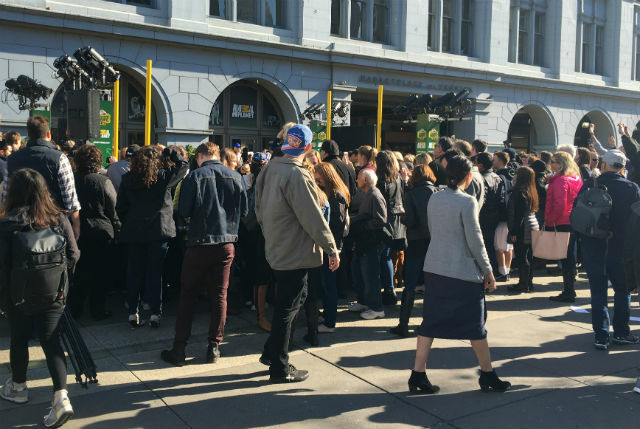 People, you would not believe the sheer level of joy and delight being unleashed down at the Puppy Bowl Cafe, just outside Gott's Roadside at SF's Ferry Building on Thursday afternoon. 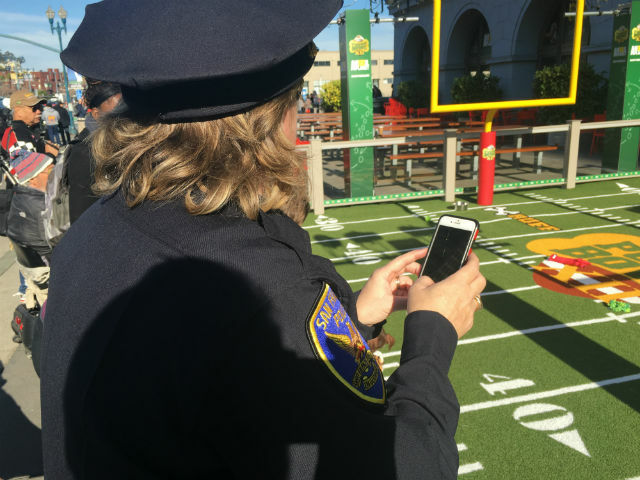 The puppies just arrived at this full-scale replica of Animal Planet's now annual Puppy Bowl, set just behind Super Bowl City, and SFist was on hand to get exclusive pics and video of the puppies populating their positively pawsome playspace. 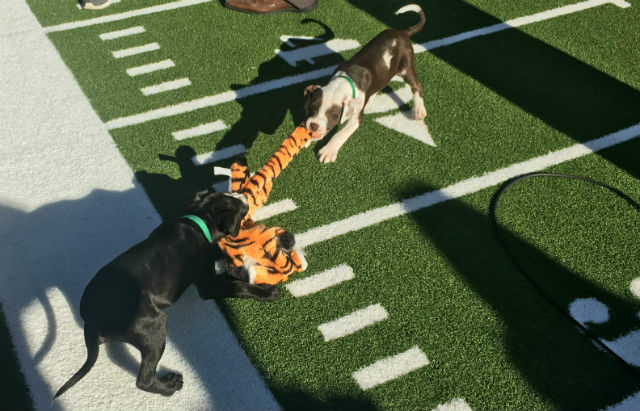 Two dozen puppies from San Francisco Animal Care & Control and the East Bay SPCA will take turns in shifts for regulation play between 11 a.m. and 8 p.m. every day through Saturday, and til 3 p.m. on Sunday. And yes, all these puppies are all available for adoption. For the most squee-worthy and adorable thing you will see all day, the video above shows a puppy pile-up being enjoyed by a human baby with a choice front row seat. SFist captured the first four minutes of live regulation play, right as the puppies took the field for a fierce competition of chasing tennis balls, playing tug-of-war with the Lamb Chop toy and sniffing one another's rear ends. 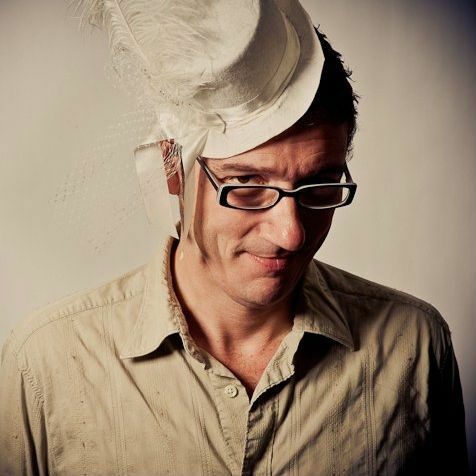 "There's a lot of unnecessary ruff-ruff-roughness that I'm going to throw flags for," ruffaree Tommy Gimler told SFist. "And excessive cuteness [penalties]. The puppies know what they're doing. They're all looking for forever homes. This is like a scouting session out here." In honor of Super Bowl 50, all of the pups are available for 50 percent off their normal adoption fees (about $87.50 after discount). The little lovelies are under contract to play through Sunday afternoon, and will be available for pick-up Sunday (for East Bay SPCA dogs) or Monday (for SF Animal Care dogs). Gott's Roadside, which is hilariously themed-out in Puppy Bowl decor, will make a $1 donation to the cause for every "Tailwagger Burger" sold between now and Sunday. Even the police and paramilitary security officers are getting their hearts melted by the puppies playing "wide retriever." 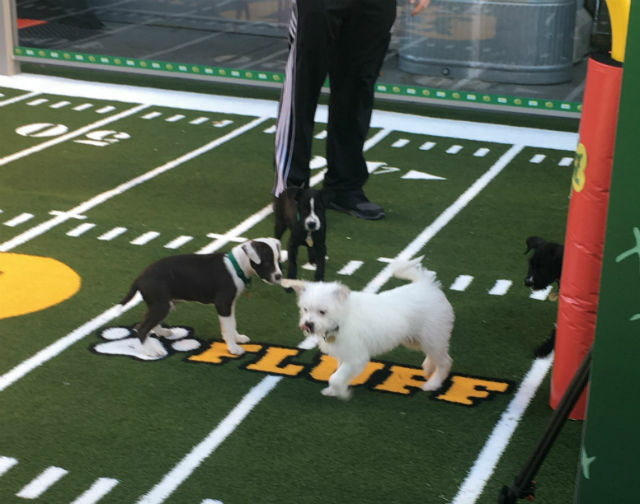 Other attractions at the Puppy Bowl Cafe include a Puppy Bowl virtual reality experience, with goggles provided onsite for 3D virtual reality encounters like "Three Dog Tug-of-War." If you have the Google Cardboard headset, you can download it and play at home. 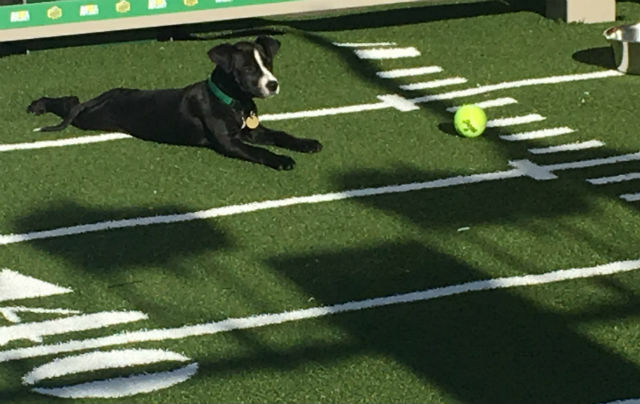 Do not expect to immediately get close to the puppies at the Puppy Bowl Cafe. Expect to see crowds of this size around the attraction, and bring your patience and persistence if you aspire to get up front to see the puppies. The Puppy Bowl Cafe remain open today through Saturday from 11 a.m.- 8 p.m. and Sunday, February 7 from 11 a.m.- 3 p.m. 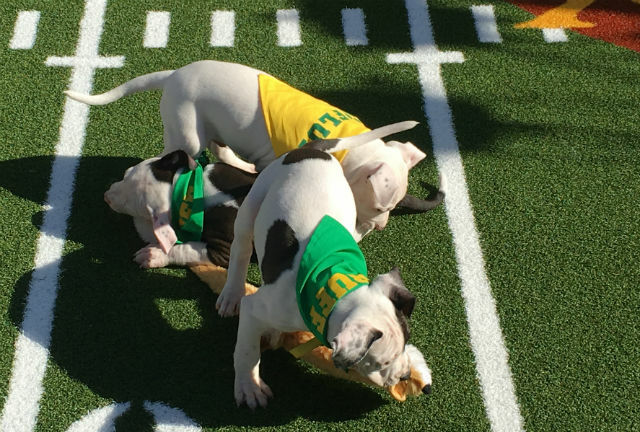 The actual Puppy Bowl TV broadcast begins at 3 p.m. PST Sunday on Animal Planet.